New Modular Broadsweepers and Optical Boosters for OEM Applications. Superlum introduces new compact Broadsweepers (swept-wavelength tunable lasers) for OEM customers. With a footprint of only 110 × 190 mm, the new devices have the same functionality as our benchtop Broadsweepers, thus becoming highly attractive for integration into customers' equipment. The akinetic design of the external cavity with a precisely stabilized acousto-optic filter ensures excellent repeatability of the wavelength setting while tuning and sweeping. The laser output can be boosted by a stand-alone optical power booster of the same footprint. Both units are 12 V DC-powered. The units can be controlled from a PC/Laptop and can also be switched on and off by a TTL-level signal. Preliminary specifications for 840-nm devices are already available. Custom combinations of tuning range and optical power are available upon request. New uncooled single transverse mode free space SLDs in 780 – 920 nm range. Superlum has expanded its product line of uncooled single transverse mode free space SLDs in 780 – 920 nm range. The following new models has been added: TO-9 canned medium-power modules with an output power of 20 mW at 795 , 880 , and 920 nm , and 30-mW TO-56 canned SLD modules at 850 nm . These reliable high-brightness low-coherence light sources can be a good replacement for laser diodes in applications suffering from speckles and other kind of system noise associated with narrow spectrum and high temporal coherence of laser diodes. New SLDs at 670 nm with record-breaking performance. Superlum announces new SLDs at 670 nm with record-breaking performance. Two new models are commercially available: 15-mW uncooled TO-9 SLD-260-HP-TO9-670 and 10-mW SM/PM fiber coupled butterfly packaged SLD-261-HP2-670 . Moreover, Superlum is finishing the development of ultra-high-power single mode SLDs at this wavelength. Preliminary ratings are 25 mW in free space (SLD-260-UHP ) and 15 mW ex SM/PM fiber in butterfly packaged SLDs (SLD-261-UHP ). Both free space and fiber coupled modules are already available in small quantities. New generation of cBLMD-series compact broadband light source modules with extended bandwidth. Superlum has introduced the second generation of cBLMD series of multiple-SLD light source modules with extended bandwidth. A key advantage of the new generation of cBLMD light sources is that the drive current of each SLD can be controlled individually, making it possible to tailor the optical spectrum to meet customer requirements. New product lines of made-to-order single-SLD light sources. Superlum has significantly expanded its portfolio of made-to-order single-SLD light sources, allowing customers to choose a product that best fits their needs. The new offerings include 9-30 V DC-powered mCS-series modules with a fiber pigtail, sCS-series modules with an FC/APC socket, CS-series modules with an integrated optical isolator and other components, and 12 V DC-powered cBLMD-S-series modules with digital control of SLD parameters. Ultra-wide-spectrum SLD modules belonging to the UBB-series are now commercially available. The modules are available at 830 nm (SLD-351UBB having a 6-dB spectrum width of 85 nm), and at 930 nm (SLD-471UBB having a 6-dB spectrum width of 115 nm). The modules are butterfly packaged and SMF or PMF pigtailed. Free-space modules are available upon request. While targeting ultra-high resolution SD-OCT as the main application, these SLDs can be successfully used in a wide range of other types of optical sense and measurement systems. New ultra-broadband SLDs and SLD light source devices. Superlum starts offering UBB-series (ultra-broadband) of SLDs and SLD light source devices. The main design goal was to cover the maximum possible spectral range by the minimum number of SLDs while preserving acceptable spectral flatness within the 6-dB spectral range around central wavelength. The newly introduced light sources, cBLMD-D-890-UBB-HP (12 V DC-powered) and M-D-890-UBB-HP (AC-powered benchtop), provide a 6-dB spectral width of 190 nm with a spectral flatness better than 4 dB. UBB-series SLD modules providing a 6-dB spectrum width of 80 nm at 830 nm and of 100 nm at 930 nm will also be added to our product list very soon. Superlum expands its product lines to include new free-space and fiber coupled SLD modules. New low-cost SLD-380-MP-TO56 module is now available at 830 nm. The important advantage of this SLD is nearly elliptical far field pattern. This allows direct replacement of laser diode modules in free space systems for reducing undesirable parasitic effects caused by laser diode temporal coherence, notably speckles. New high-power multimode fiber pigtailed SLD modules SLD-M381, SLD-M341 and SLD-M531 are available at 840, 855 and 1065 nm center wavelengths. These devices can be very helpful for low-speckle optical illumination for various applications in photonics where multimode fibers are used for delivery of light. These SLDs are characterized by reduced sensitivity to optical feedback, compared with single mode SLDs. A new model of Broadsweeper BS-930-1-HP with extended wavelength-tuning range. Superlum is pleased to introduce a new model of a high-power wavelength-swept laser, the Broadsweeper BS-930-1-HP with an extended wavelength-tuning range. The laser is built on the use of a quantum-confined SOA and a quasi-collinear AOTF in an external fiber ring cavity. The device has demonstrated the full tuning range of up to 135 nm at the output power of 15 mW that is the best result ever shown for rapidly swept lasers in 880 – 1010 nm spectral range. The device can sweep the emission wavelength with a sweep speed from 2 nm/s to 104 nm/s. The laser offers the end-user different modes of operation — the manual sweep mode, automatic sweep mode, external sweep mode and two-wavelength switching mode. The model provides high spectral and power stability of laser emission both in time and in temperature. High spectral tuning accuracy and reproducibility together with strictly linear emission frequency sweep in time are ensured. The device is equipped with a PM-fiber output that guarantees high values of PER of laser emission (> 20 dB). Thanks to these advantages of the developed model over the existing BS-930-1, this new swept source can find its place in a variety of applications requiring high-power laser emission together with rapid wavelength tuning over a wide band of wavelengths covering 880 – 1010 nm. To the best of our knowledge, the new model of the Broadsweeper considerably exceeds the existing analogues. Application Note "Tunable Semiconductor Laser with Continuous Tuning in 880 – 1010 nm Spectral Range." (PDF, 320 KB). Technical Product Specification (PDF, 228 KB). Superlum is pleased to announce a new achievement in developing of high-power SLD-based light sources, namely, the first commercial 850-nm SLD-based benchtop system emitting 50 mW from PM-fiber with a smooth, low-rippled optical spectrum. The design is based on the "SLD MOPA" approach described in the corresponding application note . It is 100% PM-fiber-based and provides stable output polarization with PER of 20 dB at the fiber output. In addition to very high optical power, there is another important advantage of the "SLD MOPA" design, namely, its reduced sensitivity to optical feedback (see the application note for more details). The instrument may be used in various applications requiring very-high-power and low-coherence single-transverse-mode light sources, for example, Optical Coherence Tomography and white-light interferometry, spectroscopy, metrology, low-speckle optical illumination, optical imaging and others. New ultra high power miniature SLD module at 1045 nm, SLD-530-UHP. Superlum introduces a new ultra high power miniature superluminescent diode module, SLD-530-UHP-TO9-PD . This 9-mm canned module has a CW output power of up to 80 mW and a spectral width of about 40 nm (FWHM). The product line of D-series BroadLighters has been expanded to include a new model covering 870 – 890-nm spectral range, D-880-MP . The new model has a spectral width of 200 nm and provides an output power of about 1.5 mW ex SM-fiber, being practically insensitive to optical feedback. New specifications of high-power SLDs at 1270 – 1330-nm range. The specifications of high-power fiber coupled SLDs at 1270 – 1330-nm range, SLD-56-HP , have been updated. The output power has been substantially increased. The HP3 category now provides an output power of up to 30 mW ex SM fiber. A new Travelling Wave Amplifier module, SOA-482, and a new D-series BroadLighter, D-860-G. The product line of Travelling Wave Amplifier (TWA) modules is expanded to include a new model, SOA-482 . The new TWA module has an optical gain spectrum centered at 970 nm with a bandwidth of 40 nm, a small-signal fiber-to-fiber gain of more than 25 dB and a maximum CW output power of 15 dBm. The product line of D-series BroadLighters is expanded to include a new model, D-860-G . The new BroadLighter has a bell-shaped spectrum centered at 860 nm, a pedestal-less peak of the coherence function and a spectral width of 70 – 80 nm (FWHM). Two power categories, HP1 (7 mW) and HP2 (20 mW), as well as an optically isolated version, D-860-G-HP-I, are available. New SLD and driver assemblies for OEMs. Superlum introduces BLMS mini Broadband Light Sources, a new product line of broadband light sources developed primarily for OEM customers. BLMS mini combines a fiber pigtailed SLD module, a high precision current and temperature controller, and an optional optical isolator in one compact and easy-to-use device. Each product is custom made with the SLD module of your choice. New specifications of medium-power SLDs at 770 – 890-nm range. The specifications of free-space and fiber coupled medium-power SLDs at 770 – 890-nm range, SLD-38-MP , were updated. New ultra high power miniature SLD module at 840 nm, SLD-340-UHP. Superlum introduces a new ultra high power miniature superluminescent diode module, SLD-340-UHP-TO9-PD . This 9-mm canned module has a CW output power of up to 100 mW and a spectral width of about 25 nm (FWHM). The product line of Fiber-Coupled SOA Modules is expanded to include a new family of near-infrared travelling-wave broadband SOAs. The new SOAs' gain bands, taken together, cover the spectral range from 750 to 1100 nm. The product line of T-series Broadlighters has been expanded to include new models, T-830-HP and T-850-HP. T-830-HP has a spectral width of 140 nm FWHM, thus covering the range from 760 to 900 nm, and provides an output power of up to 16 mW ex SM fiber. T-850-HP has a spectral width of 165 nm FWHM, thus covering the range from 760 to 925 nm, and provides an output power of up to 16 mW ex SM fiber. These high-power, extremely low-coherent benchtop instruments are ideal for ultra-high-resolution OCT imaging. New SLD modules with very wide spectrum centered at 1000 – 1060 nm. A new series of high power SLD modules centered at 1060 nm, SLD-54 , is introduced. The new modules have a spectral width of 70 nm (FWHM) and provide an output power of up to 20 mW ex fiber. These modules, along with corresponding benchtop light sources with optical isolators, will be available for ordering starting January 2013. The SLD-52 series was expanded to include new SLD modules centered at 1000 nm. The specifications were updated to reflect the change. SLD-34 series is renewed: new SLD modules are added and existing SLD modules are updated. New high-power and medium-power SLD-34 modules at 810 – 880 nm has been available since December, 2012. First SLDs at 840 nm with a 50-nm-wide bell-shaped spectrum for spectral-domain OCT systems. Superlum introduces the first SLDs at 840 nm, SLD-34 , with a 50-nm-wide bell-shaped spectrum for spectral-domain OCT (SD-OCT) systems. One of the main advantages of these novel devices over the existing SLDs at this spectral band is a pure, sidepeaks-free structure of the coherence function. 2-mW and 8-mW SMF or PMF butterfly packaged modules are available as standard options. Additionally, SLDs with reduced sensitivity to optical feedback, which can tolerate an optical feedback to the SLD of up to 4%, are introduced. Standard modules are butterfly packaged. Other packages are available upon request. SLDs can be integrated into miniature plug-n-play SLD-MS light source modules which are ready for immediate use in OCT systems. New miniature SLD based light source modules, SLD-MS and BLM2-D.
Superlum introduces a new product line—miniature SLD-based light sources. This product line consists of a series of single-SLD-based "SLD-MS" light sources, and a series of broadband "BLM2-D" light sources which are based on two SLDs. The first instrument, SLD-MS , targets applications that require easy-to-use, plug-n-play, stable and reliable SLD-based light sources insensitive to the ripple and noise from ordinary power supplies. The SLD-MS features a lot of options including power control (either by the internal potentiometer or by an external analog voltage), constant-current or constant-power SLD driving, and fast (up to 100 kHz) SLD switching on and off. The SLD-MS module is recommended for all customers as a new, miniature version of our light sources composed of an integrated or stand-alone SLD and its controller. The second instrument, BLM2-D , is the first compact version of our well-known D-series Broadlighter. The BLM2-D modules have been developed mainly for OEM customers to facilitate the integration of these complex, state-of-the-art SLD-based light sources into their systems. New superluminescent diode modules, SLD-33-MP and SLD-33-HP, and new Broadlighter D-810. Superlum introduces new broadband superluminescent diode modules, SLD-33-MP and SLD-33-HP centered around 780 nm with a typical spectrum width (FWHM) of 50 nm, including a record-breaking 25-mW SM-fiber coupled model, SLD-331-HP3. The D-series Broadlighter product line is expanded—a new model, Broadlighter D-810-HP , is introduced. This benchtop instrument with a 100-nm-wide spectrum centered at 810 nm is designed for ultra-high-resolution OCT and other applications that require high-power, broadband, low-coherent light source covering the spectral range from 760 to 860 nm. New D-series and T-series Broadlighters. The product line of D-series Broadlighters has been upgraded and new models are introduced. An optical isolator is now a standard option in the most powerful D-series light sources. A new high-power Broadlighter, the Broadlighter T-860-HP , has a 135-nm spectrum width (FWHM). This model has replaced the previous model T-840-HP which has a 100-nm-wide spectrum. These high-power, extremely low-coherent benchtop instruments are ideal for ultra-high-resolution OCT imaging and other applications. Superlum demonstrates 50-mW SLD-based light sources with low sensitivity to optical feedback. Superlum announces that it has achieved record-breaking power levels for SLD-based light sources. The light sources utilize Master-Oscillator-Power-Amplifier (MOPA) configuration in which the light from a medium power master SLD is amplified by an appropriate semiconductor optical amplifier (SOA) of the same wavelength. The use of MOPA system allowed us to demonstrate a light source at 840 nm with an output power of 50 mW ex SM-fiber and a spectrum width of 15 nm, while still having a negligible spectral ripple. An important advantage of the light source is its reduced sensitivity to optical feedback. For more details on the new light sources, please refer to our new application note Boosting of SLD Power. Feedback-Insensitive, Ultra-High-Power MOPA SLD Sources . A new generation of medium-power SLDs at 770 – 890-nm range has been available since March, 2009. The new SLDs have the same electrical and mechanical specifications as the earlier generation ones, allowing drop-in replacement with improved performance and lower price. Free-space: SLD-380-MP-TO9-PD. They are the next generation of uncooled 9-mm canned SLD-380-MP1,2,3-TO9-PD. Their output power reaches 20 mW in free space, that is, more than twice the power of former 380-MP3 (7.5 mW). SM- or PM-fiber coupled: SLD-381-MP-DIL/butterfly-SM/PM-PD. They provide an output power of up to 3 mW from SM- or PM-fiber, that is, twice the power of former SLD-381-MP1,2,3-DIL/DBUT-SM/PM modules. Moreover, SLDs with further enhanced performance are available upon request. Custom features include higher power, invisible spectral ripple, secondary coherence sub-peaks intensity below -30 dB (10log), up-to-35-nm-wide bell-shaped spectra and a lot of others. SLD-351 with a 3-dB spectrum width of up to 70 nm and an SM-fiber output power exceeding 20 mW are now available at 825-, 845-, and 865-nm center wavelength. Please see updated specifications for more details. The multimode fiber coupled 840-nm SLD-M381 has now an output power of 150 mW. We are pleased to introduce pioneering, very broadband, high-power superluminescent diode modules SLD-35-HP in a (790 – 860)-nm spectral range. Their spectrum width (FWHM) exceeds 60 nm. The development of SLD-35-HP allowed us to increase the spectrum width of Broadlighter D855 to 100 nm. The specifications of Broadlighter D855 were updated to reflect the change. The product line of traveling-wave amplifier modules at 1060 nm was expanded. SOA-532 has a 30-dB fiber-to-fiber gain and a 35-nm optical gain bandwidth at -3 dB. Operation at any selected wavelength within the full tuning range. Alternation between the two desired wavelengths (any two wavelengths from the full tuning range may be chosen). Linear sweep of wavelength with a rate of 200 Hz over the full tuning range (50-nm), and of 1 kHz over any 10-nm interval within the full tuning range. Superlum introduces the first SLD modules emitting at 650 nm, SLD-25-LP. Superlum starts to offer a new line of very high power multimode SLD modules, SLD-M381-MM. These multimode fiber pigtailed butterfly modules operate in 840-nm range and have output power of 100 mW. The modules are based on newly developed broad-area SLD emitters which provide up to 200 mW of output power. Free-space versions of the modules will be available soon. Superluminescent diodes in 1170 – 1200 nm spectral range are commercially available starting December 2006. We are pleased to introduce pioneering broadband SLD modules for our scientific research customers. New medium power modules SLD551-MP are based on multilayer InAs/AlGaAs/Ga/As "quantum-dot-in-a-well" heterostructure. These SLD modules provides output power of 1 mW ex SM fiber and 3-dB spectral width of 30 nm. The modules close the gap between 770 – 1160 nm and 1270 – 1600 nm spectral ranges of conventional SLD-based light sources. Superlum introduces a new product line of light sources for OEMs, called S-series Broadband Light Source Modules. These modules have the same optical parameters as AC powered benchtop S-series Broadlighter devices, but were designed for integration into optical coherence tomography (OCT) systems. Updated specifications of fiber coupled SLD261-MP . Updated specifications of free-space SLD260-MP . Broadlighter D980 : 5 mW SM fiber output power and 210 nm FWHM. Broadlighter Q940 : 4 mW SM fiber output power, 300 nm FWHM with coherence length below 3 µm in the air! Broadlighter was cited by Photonics Spectra Magazine as one of the best new products of the year 2004. High power SLD-53 at 1050 nm with up to 30 mW SM fiber output. Very broadband SLD-52 at 1020 nm with spectral bandwidth more than 100 nm FWHM and 5 mW SM fiber output. Traveling wave amplifier modules SOA-382, SOA-372 at 780 - 880 nm. Q-series Broadlighter product line is expanded. Superlum introduces new high-power broadband benchtops Q1350 and Q1430 covering 1260 – 1490 nm and 1310 – 1560 nm spectral ranges. New high-power fiber coupled module at 830 nm spectral range is introduced. Superlum introduces a new high-power SLD module at 800 – 850 nm band, SLD-381-HP3. The new module emits up to 30 mA ex SM fiber with flat bell-like ripple-free spectrum. The specifications of SLD-38-HP modules were updated to reflect the change. New broadband modules at 1400 nm spectral range are available now. High power SLD-661-HP-DBUT-SM 3 dB spectrum width is 60 nm at 15 mW optical power ex SM fiber. Cost effective SLD-661-MP-DIL-SM 3 dB spectrum width is 65 nm at 2 mW optical power ex SM fiber. Very broadband SLD-661-LP-DIL-SM 3 dB spectrum width is 85 nm. New high power broadband SLD-571-HP-DBUT-SM module is available now at 1300 nm spectral range. 3 dB spectrum width is 50 nm at 10 mW optical power, 60 nm at 5 mW optical power ex SM fiber. Viatcheslav V. Prokhorov, Engineer, post-graduate student. The Award for Broadlighter D-890. Superlum was honored by Photonics Spectra Magazine with a Photonics Circle of Excellence Award for developing one of the twenty-five best new products of the year 2004, Broadlighter D-890. These awards are bestowed annually in recognition of excellence, innovation and achievement in new product development in photonics technology. New activity of Superlum – Gain Modules for tunable lasers. Please download soa371.pdf file for more details. New medium power broadband SLD571-MP2-DIL-SM module is available now at 1300 nm spectral range. 3 dB spectrum width is 70 nm at 1 mW optical power ex SM fiber. Product line of D-series Broadlighters was upgraded! MP-rated Broadlighters are available since September 2004. D830-HP2 – 12 mW SM fiber output power and 70 nm FWHM at 830 nm center. D855-HP1 – 6 mW SM fiber output power and 80 nm FWHM at 855 nm center. D890-HP1 – 6 mW SM fiber output and 150 nm FWHM at 890 nm center. D1300-HP1 – 100 nm and 5 mW at 1300 nm. Professor J. Fujimoto's group M.I.T., working with collaborators at the New England Eye Center, achieved ultrahigh resolution OCT images with ~2.3 μm resolution in microscopy and ~3.2 μm resolution in the human retina, using the BroadLighter D890. SLD-381-HP1 module is available at 790 nm spectral band. 10 mW ex SM fiber! Since March 2004 we are offering SLD-38-HP1 power category module with central peak at 790 – 795 nm. 20 mW ex SM fiber modules will be available soon. Bandwidth of medium power categories at 790 nm spectral range has increased up to 18 – 20 nm FWHM. New cost-effective 1 mW SLD "S-type" light sources are available at 680, 820, 1300 and 1550 nm. Wall-plug powerful light sources "S-type Broadlighters" provide up to 10 mW SM fiber output power at 1300 nm spectral band. Constant power operation with direct control of output power, and polarization insensitive fiberoptic isolator allow excellent stability of performance parameters. BroadLighter D830-HP, 3 mW ex SM fiber output, bandwidth 70 nm FWHM. BroadLighter D890-HP, 3 mW ex SM fiber output, bandwidth 150 nm FWHM! New BroadLighter is available at 930 nm. It has 100 nm spectrum FWHM and less than 10 µm coherence length. The device may be very useful for OCT and other low-coherence interferometry applications. New Products: Superlum BroadLighters at 1300 -1550 nm spectral bands. Since 2003 Superlum is offering commercially new devices: BroadLighters, in which two or more spectrally-shifted SM fiber coupled SLD modules are combined to get a poweful and very broadband radiation. Very broad spectrum SLDs at 1450 nm and 1550 nm. Since September 2002 Superlum has been offering commercially extremely broadband (100 nm FWHM) SLD-76-LP at 1550 nm and 1450 nm with residual spectral modulation as small as 1%. 7 mW SM fiber output, 50 nm FWHM 830 nm SLD-37-HP for OCT and other sensor applications. High-Power (HP) series of a very wide spectrum 830 nm band SLD-37-HP is available now from Superlum. High output power and wide spectrum of SLD-37-HP allows a further improvement of resolution in optical coherence tomography and other similar applications. Since July 2002 SLD-761 is available at a considerable lower price. 10 months ago the programm to decrease internal costs of SLD-761 modules was started at Superlum Diodes. As a result of this programme, prices of standard SLD-761 modules are 25 – 30 percent less since July 2002. SLD-76 is available at 1440 nm band. Since July 2002 SLD-76 devices emit at 1440 nm, too. Both medium power and high-power diodes are available. New products will be available soon. Superlum is finishing developments of the following new products: high power series of SLD-37, 5 – 10 mW SM fiber modules; extremely broadband SLDs at 1550 nm (FWHM greater than 100 nm, 0.1 mW SM fiber output). Both products should be commercially available since August – September 2002. SLD-76 is available at different wavelengths within 1480 – 1620 nm range. High-power SLD-76 prototypes are commercially available. Since Septemeber 2001 Superlum is offering HP1-rated SLD-761 modules with 5 mW output power at 1480 nm and some other wavelengths from 1480 – 1620 nm band. 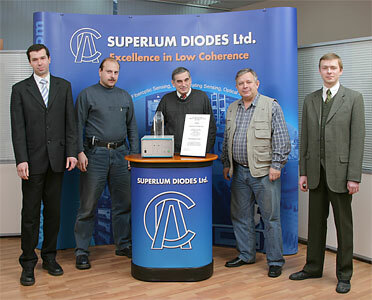 SUPERLUM Ltd. have changed its name to Superlum Diodes, Ltd. Due to increased sales, we have rented additional 250 sq. m for carrying works on design, development and control of superluminescent diodes – the heart of our modules. 1480 nm and 1550 nm SLD modules are now commercially available. Modules provide up to 2 mW SM fiber output and have excellent, low-rippled spectrum. Devices may be extremely inetresting for testing of fiber-optic components, including Er-doped amplifier components and passive DWDM devices. SLD-48-MP are now available at 1045 nm. Since October 2000 SLD-48-MP diodes are available at 1045 nm center, with 50 nm FWHM low-rippled spectrum. Output power from SM fiber pigtail is 1 mW (up to 2 mW may be delivereded upon request). SLD-47 series provides more than 7 mW SM fiber output with 70 nm FWHM at 950 nm band. Since October 2000 we are offering SLD-47-HP category with greater than 7 mW SM fiber output at 940 nm range. New packages available. In October, 2000, in addition to existing packages, we provide: double-sided butterfly package, 5.6 mm TO cans, and a new miniature 'MINIBUTterfly' fiber package (10 × 10 × 4 mm frame size). SLDs cover more wavelengthes in range from 1480 nm to 1560 nm. As a result of design efforts at this band, SUPERLUM is now offering engineering quantities SLD modules rated from 0.5 mW to 2.5 mW ex SM fiber output centered at 1480 nm, 1530 nm and 1560 nm. The device ratings will be finally added to our Web Site by the end of July. However,you can ask us on any detail right now. SLD-26, 680 nm series diodes are now more powerful. SM fiber output up to 20 mW, and free space outputs up to 40 mW are now available. Maximum residual spectral modulation depth is now rated to 3%, twice less than before! In addition, devices are now divided into different power categories, allowing our customers to select devices that match their requirements better and safe budget when very-high-outputs are not necessary. Considerbaly lower priced, 3 mW free space, 1 mW ex fiber, SLD-26-MP category is now available. 1480 nm SLD modules will be available soon. SUPERLUM is planing to offer commercially 1480 nm - centred SLD module prototypes starting from mid February 2000. Modules will have 1 – 2 mW SM fiber output with about 50 – 55 nm FWHM and a small spectral modulation depth. SLD-56-HP series diodes with up to 5 mW ex SM fiber output are available in engineering quantities. This is the result of our efforts for the further improvement of 1300 nm SLD emitter, as well as the coupling method. PILOT-2 drivers are now available with possibility for setting and indication of SLD driving parameters. New compact drivers, when supplied by 9 V DC, provide excellent stability and protection of SLD modules, with idication and setting of SLD current, temperature and monitor photocurrent. New PILOT-2 drivers may be used with any of SLD module produced by SUPERLUM Ltd.
SLD-36 series diodes are removed from our product list. The substitution to the old module is SLD-38-MP diodes, 3 categories with the same ratings as SLD-361 A, B, C. Main advantage of 38-MP diodes is longer lifetime: MTTF greater than 100000 hours at +25 °C is already confirmed, target value is 200000 hours (SLD-36 diodes has a MTTF of 60000 hours). Another advantage is lower prices at high quantities. Such specific wavelengths as 780 nm, 808 nm and 920 nm are now available with our superluminescent diode modules. Improvement of 1300 nm diodes has resulted in increased outputs of SLD-56 series devices. Now three categories of diodes are available, rated typical 0.5, 1.0 and 2.0 mW ex SM fiber output power. Soon, 0.5 mW Ex fiber 1550 nm band prototypes will be available. On April 1999 new version of our PILOT drivers will be commercially available. The main advantage of the new driver is a possibility to control SLD current and temperature and their changes. It is also planned to add indication of SLD current, thermistor resistance and monitor photocurrent.